Design newsletters, create flyers and edit documents all with one program! 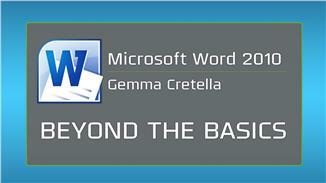 This course will help you move beyond the basics and learn the finer points of Microsoft Word 2010. Learn a set of skills that will enable you to create more professional looking documents without spending the time trying to figure it out on your own. This course will help you apply what you learn with practice exercises including formatting newsletter, editing a research paper, creating a flyer and performing a mail merge. How to create a style format. Way to take a screenshot and insert a hyperlink. How to edit a research paper in Modern Language Association (MLA) format. Techniques to add sources, citations and a table of contents to a research paper. A method to create your own flyer with photos and text. How to customize your text and graphics. Tips to design your own newsletter, including format and layout. How to perform your own mail merge. An easy way to create your own envelopes with addresses. Techniques for reviewing your documents. Gemma Cretella is an award-winning educator in computer science and business and career development at The Art Institute of Philadelphia. She has more than 20 years experience teaching technology and career skills. Cretella is the author of multiple instructional guides for software, including The Basics of Microsoft Office PC and MAC, The Basics of Microsoft PowerPoint and The Basics of Microsoft Word.